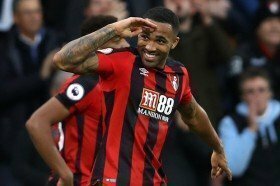 Chelsea's hopes of signing Callum Wilson have been dashed with Bournemouth having no plans of selling the striker in the current transfer window. The 26-year-old has been heavily linked with the Blues over the past few months with Maurizio Sarri not entirely pleased with the current striking options. According to The Mirror, the Blues are unlikely to tempt Bournemouth into sanctioning Wilson's sale this month despite the Cherries recently landing the signature of Dominic Solanke from Liverpool on a permanent basis. Blues boss Sarri has recently voiced his concern regarding the options in the final third with both Morata and Giroud struggling to score goals on a regular basis amid their fitness issues every now and then. Morata has netted nine goals for the Blues this term but he has been guilty of missing several clear-cut chances in front of goal. Giroud, meanwhile, has gone through a similar struggle with just five goals on the board.